This photograph has been scaled down; full resolution photograph is available here (800 by 556 pixels). WEAPONS DETAIL Ground crew cleaning what looks like a MG 151 15/20mm cannon barrel. This was one of the main aircraft weapons used after 1941 and fitted to most front-line aircraft. Aircraft has been identified to belong to Hans-Joachim Marseille's Bf109F Yellow 14 of JG27, Libya 1942. Marseille's mechanics Hoffman on the left, and Berger on the right, weapons cleaning. Marseille was killed after bailing out of his fighter, after it developed engine failure, striking the vertical stabilizer on Sept. 30, 1942 he was created with 158 kills. OOPS!...Did it again Hans-Joachim Marseille was credited with 158 air-to-air kills, before he was killed bailing out of his Bf-109F. AIRCRAFT ARMAMENT: The first Bf-109F models were armed with the Waffenfabrik Mauser MG 151/15mm cannon later it was replaced with the MG 151/20mm cannon. About 1,380 Bf-109Fs were built between October 1940 to August 1941 the fighter was built by AGO, Arado, Erla and Messerschmitt. THE MG 151/20MM CANNON: This model was developed in 1941, and became the standard armament for fighters and bombers used by the Luftwaffe, later it was replaced again with the heavy hitting 30mm MK 108 cannon. Standard armament for the Bf-109F was two synchronized 7.92mm machine guns w/500rpg and 1x20mm MG 151/20cannon firing through the propeller hub w/60rounds. Some pilots felt it was a step backward, as the MG 151/15mm cannon carried 200rounds others felt the armament too light compared with the Bf-109E, that was armed with 2x7.92mm machine guns, and 2x20mm cannons. But most pilots looked at the armament, that was mounted in the centerline and fired a concentrated cone of fire at the target. 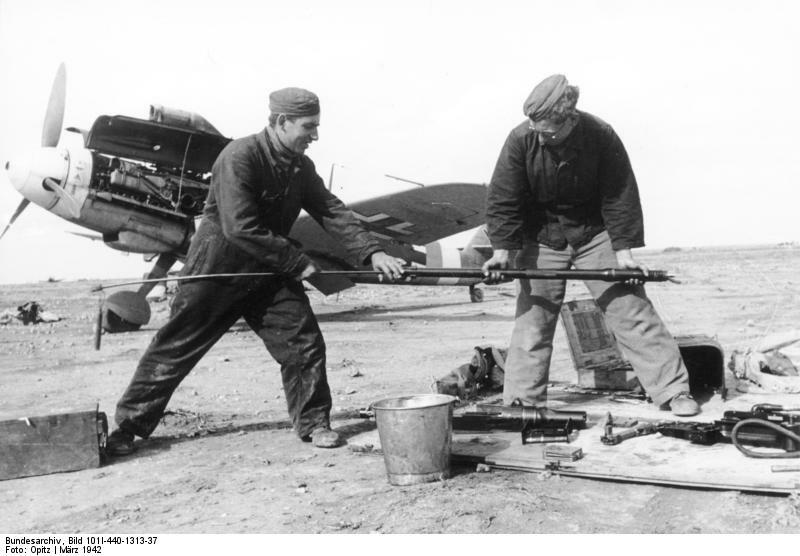 After World War II the MG 151/20mm cannons along with other ex-Luftwaffe aircraft armament were salvaged and used in many of the post-war air forces in Europe. Both the French Army and Air Force used the weapons in fixed and flexible mounts. The weapons is still in production today and has been improved over the years.